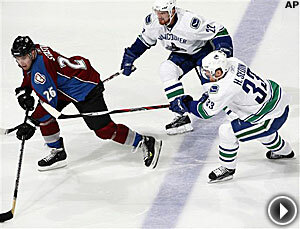 The Avalanche broke a seventh-place tie with the Canucks in the tight Western Conference playoff race with their second straight win on home ice following a four-game skid. Peter Forsberg may not be his old self yet. But it looks like he’s getting there. Colorado coach Joel Quenneville moved Forsberg from the Avs’ third line to the second unit with Milan Hejduk and Paul Stastny. The newly united trio combined for nine points, with Forsberg setting up two of Colorado’s four second-period goals in a 6-3 victory Wednesday night at the Pepsi Center. Forsberg had contributed just three assists and battled a groin injury since rejoining the Avs late last month. He has yet to score a goal and had been on the third line as Quenneville tried to limit his ice time due to the groin problem. ''I don't know if I'm back yet. Those weren't the prettiest points, but I'll take them anyway,'' Forsberg said. The Avalanche broke a seventh-place tie with the Canucks in the Western Conference playoff race with their second straight home win following a four-game skid. The Canucks lost their third straight overall and fifth in a row to Colorado. Forsberg, who sat out the first four months of the season because of a right foot injury and recently missed six games with a strained groin, said he's finally skating better. Quenneville noticed — and made the switch, switching Forsberg with Ryan Smyth. As far as the Canucks were concerned, Forsberg picked the wrong night to turn back the clock to the days when he was among the NHL’s top players. ''He adds another dimension to that team — another dimension to a team that is already good at scoring,” Canucks forward Markus Naslund said. Colorado turned the 2-1 deficit into a 5-2 lead by 11:31 of the second period — after which Vancouver coach Alain Vigneault pulled goaltender Roberto Luongo and replaced him with Curtis Sanford. "It is unusual to get to him like this," Hejduk said of Luongo. "It just does not happen often. We had good chances tonight, and sometimes the pucks just go in." Stastny, Cody McLeod, Hejduk and Ben Guite scored goals in a 6 1/2-minute span as the Avs matched their season-high for goals in a period. Stastny's 23rd goal tied it at 4:54 and followed a great pass to Hejduk from Forsberg. Hejduk's shot hit the left post and Stastny sent the rebound shot past Luongo. McLeod's fourth goal of the season, off a long pass from John-Michael Liles, put the Avs in front 3-2 at 6:07. Hejduk made it 4-2 at 10:29 with his 24th goal on assists from Stastny and Forsberg, and Guite's 11th goal of the season at 11:31 forced the Canucks to switch goalies. “It was one of our better periods of the season,” Quenneville said. Vancouver’s Sami Salo cut the margin to 5-3 when he scored with 10 seconds left in the second period, but Hedjuk beat Sanford 23 seconds into the third period to restore the Avs’ three-goal margin. The Avs took an early lead when Jordan Leopold scored a power-play goal 5:10 into the game. But the rest of the period belonged to the Canucks, who controlled the action and took the lead on goals by Daniel Sedin at 9:59 and Taylor at 13:18. The loss left the eighth-place Canucks two points ahead of Nashville and three in front of Edmonton in the West. “I think we were still in it after the first, but in the second, they generated a lot of chances and crashed the net," Luongo said. "We have been up and down the last few months but we are not panicking, we've just got to get ready for the next game and take care of business." Columbus was determined not to get blown out at home by the Blackhawks again. Mission accomplished. The Blue Jackets, who lost 7-2 and 6-3 in the Hawks’ last two visits to Nationwide Arena and had lost three in a row overall, allowed Chicago just 17 shots and made it easy for Fredrik Norrena to record his second shutout of the season. "The first four minutes we played pretty good, came out strong," Chicago coach Denis Savard said. "Then we took some bad penalties, gave them the momentum and never recovered." Clay Wilson, a rookie defenseman playing his second NHL game, assisted on Joakim Lindstrom’s power-play goal at 4:49 of the second period, then made it 2-0 at 7:13 of the third with his first NHL goal. David Vyborny and Michael Peca added goals for the Blue Jackets, who improved to 79 points but are all but assured of missing the playoffs due to their inconsistency. Chicago is one point ahead of Columbus and six points out of the last playoff spot with five games to play. Anaheim clinched a playoff berth and won its 10th in a row at home thanks to Jonas Hiller, who won a duel of rookie goaltenders with the Kings’ Erik Ersberg. Mathieu Schneider’s goal in the fifth round of the penalty-shot competition gave the Ducks the win. Hiller sent the game into overtime by stopping Alexander Frolov’s breakaway with 15 seconds remaining in regulation. That assured the Ducks of the point they needed to lock up the playoff berth. Both goaltenders were spectacular in overtime, with Hiller robbing Mike Cammalleri on a 2-on-0 in the final 20 seconds to send the game to a shootout. Dustin Brown put the Kings ahead by scoring in the second round, but Teemu Selanne tied it with a shot between Ersberg’s legs in the third round. Schneider put Anaheim ahead three rounds later with a wrist shot through the five-hole, and Hiller stopped Brian Willsie for the win. With starter Jean-Sebastien Giguere sidelined with back spasms, Hiller played his third consecutive game. Ersberg stopped 39 shots for the Kings, who are last in the overall standings. Patrick O’Sullivan gave the Kings the lead with a power-play goal at 9:29 of the first period. Anaheim rookie Bobby Ryan ripped a wrist shot from the slot past Ersberg for a power-play goal at 12:25 of the second period. “I saw the opening in the upper corner, and I was lucky enough to hit it,” said Ryan, the No. 2 pick behind Sidney Crosby in the 2005 Entry Draft. The youth-filled Kings, who haven’t made the playoffs since 2003, are trying to play spoilers while working to convince the coaching staff that they should be back next season.